With a nod to the journalist Philip Gourevitch (2000), by the time you read this, David Goodall will be dead. Fait accompli for the self-determination in dying and suicide prevention organisation Lifecircle. Goodall will be dead by his own hand, with a little help or assistance – AVD via SP so Lifecircle Vice-President and former Dignitas consultant physician Erika Preisig abbreviates. To unpack this humanising medical scenario, this is Assisted Voluntary Death via Sodium Pentobartial, a sedative that depresses the central nervous system. 9-10g is enough to euthanase or execute patients or prisoners. They fall into a deep sleep and seemingly forget to keep breathing. You can watch them die on screen and in reality in films such as The Suicide Tourist (2007) and documentaries such as BBC2’s How to Die: Simon’s Choice (2016). 104 year old British-born botanist Goodall ‘sojourned’ in Australia. He travelled from Australia to Switzerland by way of a week recuperating in Bordeaux where he visited close relatives before moving on to Basel. Today he ‘toured’ the Basel University Botanical Gardens with his grandchildren. This is a reluctant Grand Tour with a visit to the Final Frontier and beyond. Goodall did not want to make Switzerland his final destination but he felt that he had no choice after a failed suicide attempt back home. Here, he can be guaranteed ‘the good death’ – to re-appropriate the philosophers’ question of the good life. My question for you is: is – or was – Goodall a suicide tourist? He travelled no expense spared (first class tickets crowdsourced for him, costing £12,500) though with no intention of returning. He left his home for another land where he visited family and leisured poignantly with his family. In the US, Rohith Srinivas (2009) refers to people who travel substantial distances to die by suicide as ‘death tourists’. This is ‘an instance of medical tourism’, one prohibited in most states and countries but legally unpreventable as a practice. The concept is an elaboration on the ‘nonresidential suicide’ category (Gross et al. 2007) where the suicidal are attracted to symbolic landmarks out of town for them such as the high rises of Manhattan (New York) and the Golden Gates Bridge (San Francisco). Suicide prevention strategies have to engage with the desirability of these ‘fatal attractions’ (Rojek 1999) or ‘final destinations’ (Skinner 2012). Beachy Head is the iconic natural venue of choice in the UK (see Skinner 2018). The Cliffs of Moher in the Republic of Ireland (see Kaul 2018 in our new volume Leisure and Death for further insight). According to Swiss academics Saskia Gauthier, Julian Mausbach, Thomas Reisch and Christine Bartsch (2014), non-nationals who visit assisted-suicide organisations in Switzerland are ‘suicide tourists’. Examining one-way ‘visitors’ to Dignitas between 2008 and 2012, Gauthier et al. note that, on average, a British citizen undertakes a one-way journey to Dignitas every fortnight (126 suicide tourists), compared with approximately one every week from Germany (268 suicide tourists). Evolutionary biologist, anthropologist, theologian, archaeologist and philosopher Charles Foster suggests that this is an ‘outsourcing’ of English pain as the UK fails to engage in its domestic law with assisted suicide beyond the 1961 Suicide Act’s blanket prohibition on ‘encouraging or assisting the suicide or attempted suicide of another person’, a position challenged in 2009 by multiple sclerosis sufferer journalist Ms Debbie Purdy who did not want her husband to suffer for helping her to end her life abroad, and currently revisited under Noel Conway’s ongoing appeal to the Law Courts. Almost ten months ago to the day – 10th July 2017 – Brit Jemima Dixon had an AVD (assisted voluntary death). Her moment came early as she travelled to Dignitas whilst she was able to rather than wait till it was too late. Her younger sister Annabel Dixon wrote a blog of her sister’s meticulously planned journey to Switzerland. Jemima did not want any of her family to fall foul of UK law and so she organized for an independent carer to push her through the airport. Ironically, had Jemima had recourse to AVD in the UK she would have lived longer. Whilst this is not the case for David, who declares that at 104 years he is merely ‘tired of living’, the lack of clarity in the law and uncertainty in prosecution is leading to untimely deaths no matter the age of the one-way tourist. “Bon voyage” Professor Goodall, or is that, unfortunately, “glückliche Reise”. Foster, Charles (2015) ‘Suicide tourism may change attitudes to assisted suicide, but not through the courts’, Journal of Medical Ethics 41(8): 620. Gauthier S, J. Mausbach, T. Reisch and C. Bartsch (2015) ‘Suicide tourism: a pilot study on the Swiss phenomenon’. Journal of Medical Ethics 41: 611–617. Gourevitch, P. (2000) We Wish to Inform You That Tomorrow We Will Be Killed With Our Families. New York: Picador. Gross, C., Piper, T., Bucciarelli, A., Tardiff, K., Vlahov, D. and S. Galea (2007) ‘Suicide Tourism in Manhattan, New York City, 1990–2004’. Journal of Urban Health: Bulletin of the New York Academy of Medicine 4(6): 755-765. Kaul, A. 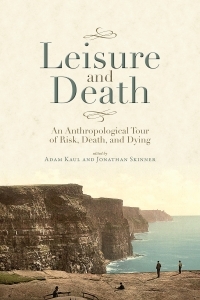 (2018) ‘That “Awful Margin” Tourism, Risk, and Death at the Cliffs of Moher’, in Kaul, A. and J. Skinner (eds) Leisure and Death: Lively Encounters with Risk, Death, and Dying, Boulder, Co: University of Colorado Press, pp.121-138. Rojek, C. (1993) Ways of Escape: Modern Transformations in Leisure and Travel. London: Macmillan. Skinner, J. (2018) ‘“This research project is not ready”: ethics and institutional hurdles in a neoliberal era’ in, H. Andrews and J. Takamitsu (eds) Routledge Advances in Anthropology Series: Tourism Ethnographies, London: Taylor & Francis, in press. Skinner, J. (2012) ‘Introduction: Writings on the Dark Side of Travel’ in, J. Skinner (Ed.) Writing the Dark Side of Travel, Oxford: Berghahn Books, pp.1-28. Srinivas, R. (2009) ‘Exploring the Potential for American Death Tourism’, MSU Journal of Medicine and Law 91: 91-122.